You might have seen a recent trend for new cryptocoins to appear with support for MasterNodes (MN) and the large number of such projects is also generating a lot of user interest. Keeping track of MasterNodes coins however and most importantly their status, including but not limited to profitability may not be that easy. Thankfully there are services that can help you in that by giving you easy access to all the information you need regarding MasterNode coins and one such is the MasterNodesOnline (MNO) that we like and use. 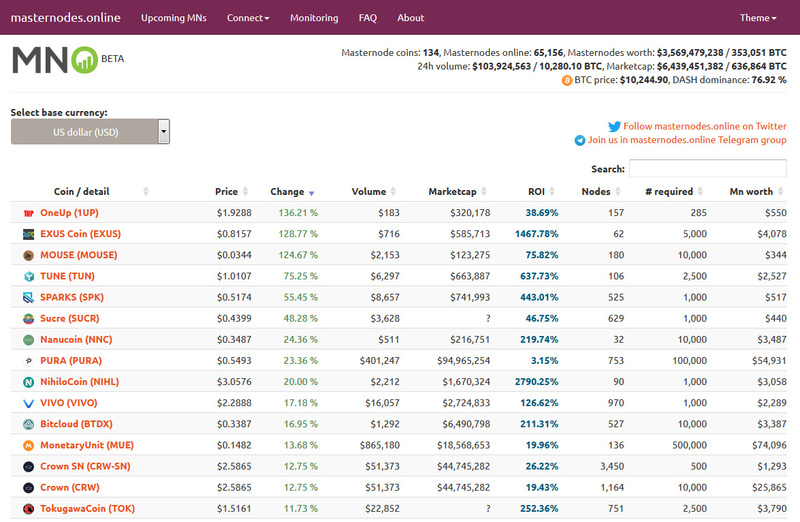 Currently the service lists 134 different MasterNode coins with details about each of the coin such as its price, volume, market capitalization, coin requirements for a MN, number of active nodes, ROI and more. All of the information is available in an easy to use and functional clear interface, so you can quickly make check for profitability for example. So you might want to give the MNO website a go and see if you will find something useful there.